With nearly 500,000 septic systems currently installed in Ireland, approximately one third of its domestic wastewater is treated on-site by means of a settling tank and/or packaged treatment plant before being discharged into a soil treatment unit consisting of several percolation trenches. At the infiltrative surface, a biological clogging zone – also known as microbial biomat – forms over time, providing additional treatment and facilitating the required distribution of effluent over the entire percolation area. Previous research has indicated that the development of such a biomat along the base and wetted sides of the percolation trenches influences the hydraulic loading rate and subsequent attenuation of pollutants in the unsaturated zone. 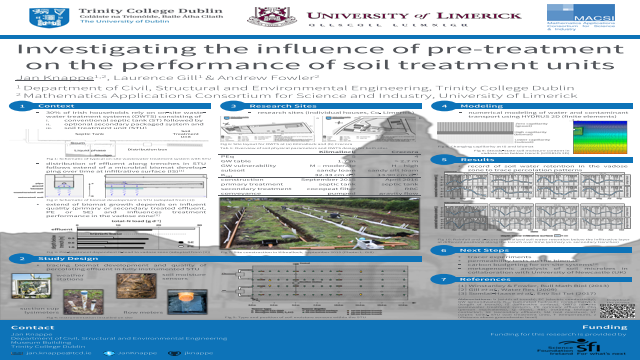 Irish studies on different subsoil permeabilities found higher nitrogen loading to the groundwater under percolation areas fed with secondary treated effluent compared to primary septic tank effluent, likely due to significantly reduced biomat formation. Based on experimental field studies, this study aims at developing effective mathematical models for describing the growth and interaction of soil biomass with nutrients and environmental factors as well as the contaminant transport and attenuation through the variably saturated soil within the percolation area in order to improve the understanding of the long-term environmental sustainability of septic systems, and will, in turn, contribute to a more insightful assessment of the cost-effectiveness of existing design guidelines and regulations. Two field research sites have been set-up to treat the domestic effluent of individual households in rural Ireland. Following a conventional two-chamber septic tank, the partially treated wastewater is then split equally into two streams: (a) direct discharge of primary effluent into one half of the percolation area, and (b) further treatment in a packaged treatment unit (rotating biological contactor or cocopeat filter) before being discharged into the other half of the percolation area. Meteorological data, wastewater production, and moisture content, temperature and electric conductivity in the percolation area are continuously recorded on site and related to effluent quality data from soil moisture samples collected in suction cup lysimeters installed at various positions and depths in the percolation area. The data from the three-dimensional sensor networks monitoring soil moisture conditions and chemical characteristics of the effluent plume within the soil treatment unit express distinct responses to hydraulic and organic loading patterns, and temporarily saturated conditions following heavy rainfall events both in areas receiving primary and secondary effluent, respectively. Additionally, greenhouse gas emissions resulting from microbial activity in the soil are quantified. The data from this study will be used to inform mathematical and computational finite elements models of the variably saturated zone beneath the infiltrative surface in order to simulate contaminant transport and attenuation, and assess the influence of pre-treatment on the overall performance of soil treatment units receiving on-site effluent to support more informed decision making in drafting guidelines and regulations for designing environmentally sustainable septic systems.